Eniva Health is proud to bring you world class dietary supplements manufactured in our NSF Certified manufacturing facility. • GMP Requirements in NSF/ANSI Standard 173, Section 8 / DIETARY SUPPLEMENTS. NSF International has independently registered Eniva Health as a manufacturer who meets GMP requirements and demonstrates their commitment to public health protection. An Official Compliant facility certified by NSF lets you know the company complies with strict standards and procedures imposed by NSF. From extensive product testing and material analyses to unannounced plant inspections, every aspect of a product's development is thoroughly evaluated before it can earn the NSF certification. Good Manufacturing Practices (GMPs) provide a system of processes, procedures and documentation to assure a product has the identity, strength, composition, quality and purity that appear on its label. These GMP requirements are listed in Section 8 of NSF/ANSI 173 which is the only American National Standard in the dietary supplement industry developed in accordance with the FDA’s 21 CFR part 111. 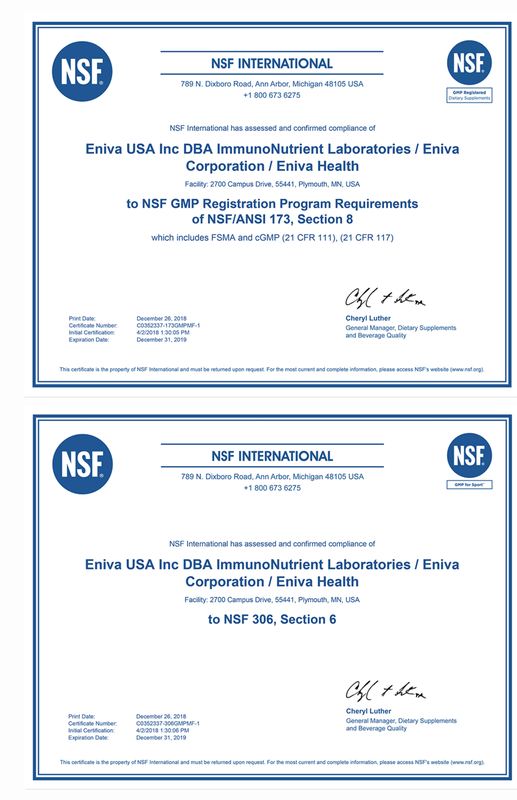 Eniva is proud to be an NSF Certified GMP manufacturer of dietary supplements.Most importantly, NSF certification is not a one-time event, but involves regular on-site inspections of manufacturing facilities and regular re-testing of products to ensure that they continue to meet the same high standards required to maintain certification over time.